Get three glasses, fill one with pure water, another with salt and the third should be half-filled with pure water, and then through a funnel, as in fig.4. pour gently the same amount of salt water. Into glass No.1place an egg. It will sink. In glass No.2 it will float on the surface, while in glass No 3 it will float midway. 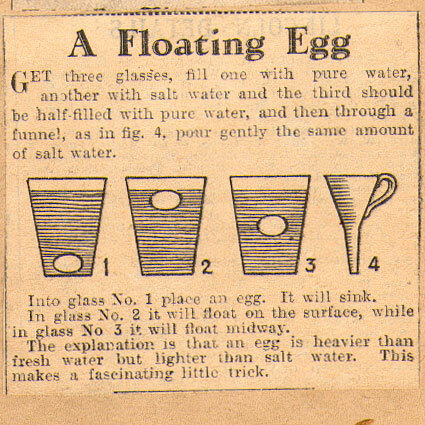 The explanation is that an egg is heavier than fresh water but lighter than salt water. This makes a fascinating little trick.